The GF351000 machine arose from Castech's experience in connecting enamelled wires and cable in electric motors and electric machines in general. It was designed to cover the needs of those who have connections that use lots of copper wires and/or large dimension cables with a theoretical section of between 25 mm2 and 150 mm2 . The machine was developed following the logic of semiautomatic operations, therefore putting together simplicity, flexibility and high productivity with the need for process constancy and reliability. Connection was made using a connector or wire terminal, normally of tinplatedcopper, as a support. When the wires have been introduced and everything has been positioned between the electrodes the machine welds, vaporising the enamel from the wires through heat, and compacts everything into a body with high electric and mechanical characteristics. The machine is closed by a pneumatic cylinder that is controlled by a pneumatic solenoid valve. The machine is prepared during the production phase with a various stage cylinder, with the number of stages being calculated according to the dimensions of the maximum connection to be carried out. The power issued by the cylinders starts from a minimum single stage cylinder of 500kg at 6 bar, going up to a threestage cylinder of 1500 kg. 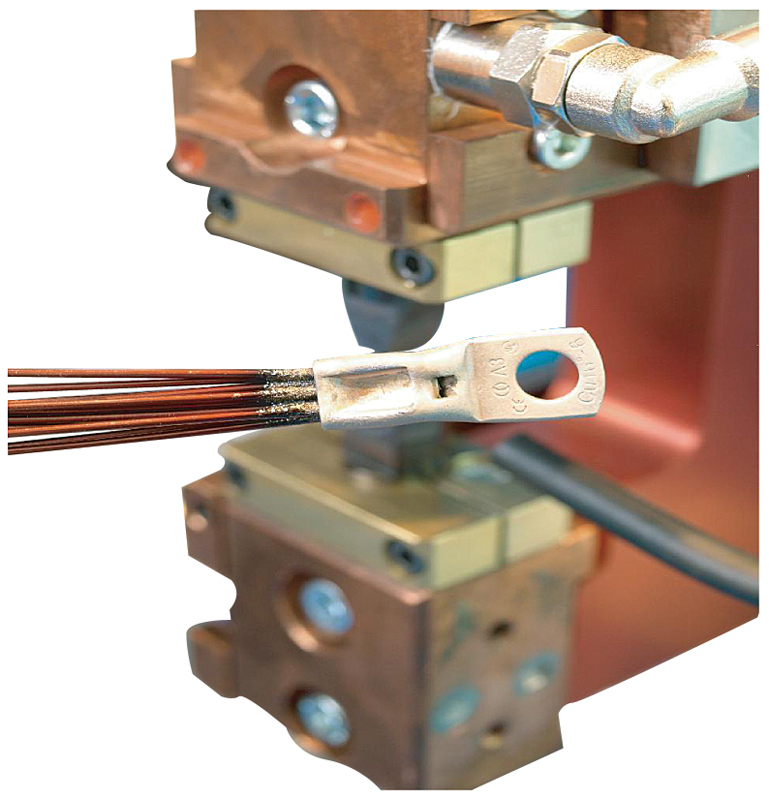 The machine has a cooling system that runs along the electrode holder, the transformer and the conductors and which dissipates the excess heat. You must connect a refrigerator, normally supplied with the machine, to the circuit. The GF351000 machine has an avant garde electronic system that was specifically designed for Castech machines. The electronics were developed with particular attention being paid to ergonomics and a user friendly interface. It is, in fact, equipped with a wide panel, is organised into pages that can be easily reached using the push buttons and scroll arrows, and the values can be changed using a wheel connected to an encoder. There are three different welding modes: voltage, heat or direct current, and any variations in the mains voltage are automatically compensated. The mechanical part was designed to make connection as ergonomic as possible, and particular attention was given to safety with the addition of a double command that activates the different welding phases. The electronic system can save up to 99 programs with different power values, active and passive times, ramp time and number of repetitions. There are also 99 cycles which run the program under a pre-set order. 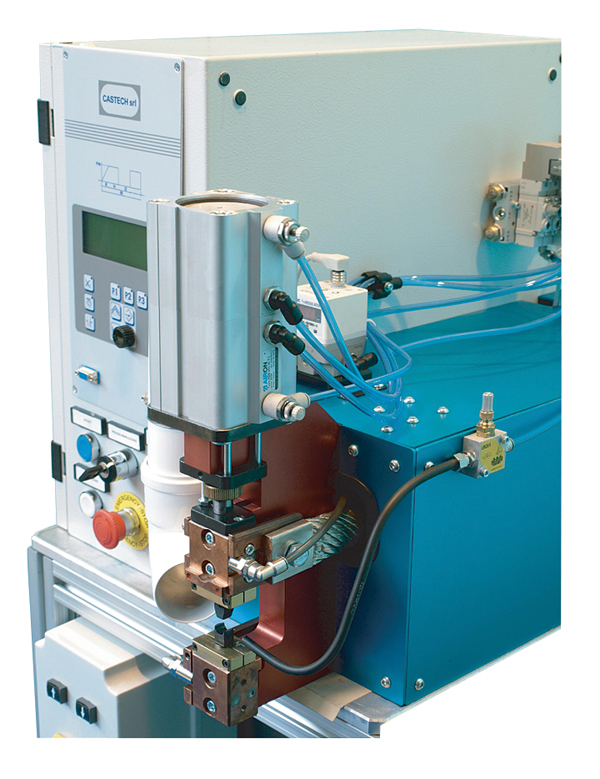 The machine has a servo valve which can set different pressure values for each program. A series of small devices supplied with the machine allow the user to change electrodes, either when worn or to change tools in a few minutes, which makes the machine very flexible.